Last year in October 2012 I’ve got my license for giving whitewater instructions on grade III water. I’ve described some of my experiences with the course in the past on this blog, last year we had a week of training with two days of exams following to test if we were good enough to pass the exam. I’ve written the below piece for the Dutch Kanosport magazine, the official magazine of the dutch canoeing association NKB (now Watersportverbond). In the last week of october an education week from the Watersportverbond was held in the French Alpes with directly appended an exam for (assistent) instructors whitewater on grade II and grade III. A week full with theoretical but mostly practical tips. For some instructors in training a nice opportunity to finish the course to be a whitewater instructor after two years of seperate learning days with safety, didactics and teaching others. For others a good opportunity to learn a lot new things and get more practice. At the end of the weeks two days of exams would be held. 3 almost instructors would only do the exam and came in on Friday and Saturday. With seven potential instructors we started the week on monday morning on the slalomcourse of L’Argentiere on the Durance. On the way over we worried a bit about the water conditions, but if the conditions stayed this way the whole week it was enough to a Whitewater grade III exam at the end of the week. 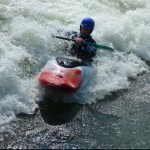 The same week a big group of Frech potential instructors were there as well, so a river full of potentials! The first day was dedicated to teaching each other and deeply handling a couple of technics, so we can transfer our knowledge and practice to our students. The weather helped with a nice sunny day and some 20 degrees, so we could easily give the first lessons and the others could act out and empathize in their roll as a student. For a potential instructor it’s important that the students make the same mistakes als real students, so you can get in your roll as an instructor. Above all you must see and feel what a student is doing wrong and why something fails. As a lesson preparation, it’s important to make an overview on paper on what you want to do, where, what you need, and what mistakes the students can make while doing your lesson. This lesson needs to be delivered to the examinators before the exam, so it can be judged as well. The error analysis in this prepartion is really important, so you know which solutions are available if a certain mistake is made by your student. The lesson preparation is an excellent tool for this. Even candidates that teach for a longer time got convinced to use it to prepare. The evenings were filled with theorie and preparing the lessons for the next day. Off course there was time for relaxing and enjoying the french cuisine. was used many times the rest of the week. Keep thinking about what you are doing and keep making alternive solutions in your head to prepare for eventual situations was the challenge for the rest of the week. Wednesday and thursday were devoted to teaching and whitewater technicks. Safety was also extensively covered. Rescuing a Boat, paddle and person from your boat and throwing ropes, but especially avoiding dangerous situtions was covered. Friday and saturday were exams day. The nice weather was gone, it rained and it was cold with only 10 degrees. To examinate safety and one owns paddling skills a wet suit was required (brrrr), so another instructor could show a good rescue. Afterwards, each instructor got to teach his own lesson to this students and could show that he was worthy of the instructors license. As a student in the group you could expect an assignment from the examinator, like pretending you were really cold, flip over in an instant or flush out of an eddy. Off course a good instructor handles those sitations well and has control over the group and the safety. Excting, did we make it or not? Especially the instructors that did their exam on friday needed a lot of patience, as the result was delivered saturday night. Unfortunately we didn’t get a 100% score, but we were close! Sunday morning… packing our bags and breaking up the tent in the snow and with a few hours delay everybody got through the snowmountains over the mountaintops to get home. Our first purpose was off course to pass the exam, but this was especially a nice, cosy, cold, learnable, inspiring weeks with countless tips and exercises so you can function as an instructor. Our “instructor tool box” was filled to the brim with new stuff. In our eyes such an education week is a very good initiative from the Watersportverbond, and highly recommended if you want to be a whitewater instructor. @eddokloosterman: @ajtetteroo leuk artikel; ben nu wel benieuwd hoe je als ‘entertainer’ optreedt als instructeur ;-). Static freediving, useful for kayakers!